Today, no country in the World is self-sufficient. So, every country has to import various goods and services from other countries to meet its requirements. But, much foreign exchange is required to pay the import bills. This has resulted in a cut-throat competition among the countries of the World to earn foreign exchange through exports. But due to many reasons, the World market has turned into a buyers’ market in respect of almost all products. This is particularly true in case of primary products. In the circumstances, sellers are compelled to sell on credit, but credit sale to a foreign buyer is risky. Due to risky nature of export trade, bankers and exporters are hesitant to involve themselves with this business. So, in order to encourage them to participate in export trade for earning much needed foreign exchange, a new type of insurance under the caption ‘Export Credit Guarantee’ (ECG) was introduced in London in 1919. Under this system of insurance, bankers and exporters are compensated for the losses incurred by them in their export credit transactions. ECGS is normally administered either by a purely Govt. department or by a separate Govt. corporation on ‘no loss, no profit’ basis. Due to its promotional and risky nature, ECGS is not a rosy business. So, private companies normally do not carry on this business. Sometimes, they are found to do it on behalf of the Govt. Recently some private companies have started ECG business on a limited scale. The Republic of Bangladesh in order to promote national exports. The wing has been subsequently converted into an autonomous department having separate budgetary provisions and accounts. An initial capital of Tk. 54.50 lacs was provided for the scheme by GOB and it was subsequently enhanced to Tk. 13.33 crore by SBC as per the instructions of the Government. Now the total assets of the ECGD is about 4 5 crores. ii) providing a range of credit risk insurance covers to exporters against losses resulting from both commercial and non-commercial (political) risks in respect of goods sold to foreign buyers on credit. Broadly speaking, the objectives of ECO are to encourage exporters to export more, attract newcomers to export business, promote new export products, to open up new market abroad. 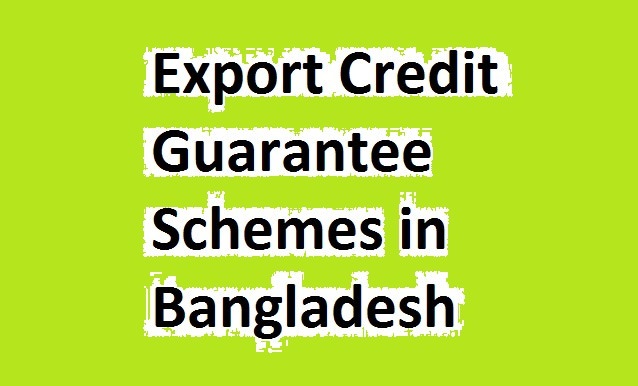 The non-availability of bank finance for the execution of export orders has been a severe handicap to the growth and diversification of exports from Bangladesh like many other developing countries. It is a fact that many exporters have lost valuable opportunities due to the insufficiency of Pre-shipment credit in relation to the volume of export order. If the credit facility required by an exporter is not easily and timely available, he not only fails to execute the order in question but also lose both the buyer and the market for future. The exporters who are new and inexperienced in the business and whose collateral are not sufficiently attractive, may make it difficult for banks to allow increased credit to them. This is particularly true in case of exporters for non-traditional products. The Pre-shipment Credit Guarantee Scheme has, therefore, been designed to protect commercial banks against losses on their Pre-shipment credits due to insolvency of the exporter or due to his failure to repay the same within four months of the due date of payment, thereby encouraging the banks to grant pre-shipment advances to the exporters on more liberal basis and easier terms than the past. The bank is required to submit the proposal to the ECGD for the guarantee in the prescribed form along with a proposal fee of Tk. 50/. The rate of premium is 0.10% if there is sufficient collateral or 0.15% per month payable on the highest amount of loan outstanding on any day during the month. Exporters need to obtain financial assistance from Commercial Banks at the Post-shipment stage not only to continue their export activities but also to replenish their working capital. Without post—shipment credit facilities from commercial banks, some exporters may not be able to export goods to buyers abroad on credit terms or to execute other export orders in hand for want of finance. If they do not have sufficient working capital of their own to continue their export business, they would have to await payment from exports already made. Generally, exporters fail to adjust the post-shipment account with the bank when payments for goods sold on credit are not made by the buyers abroad. Under such circumstances, banks in our country are hesitant to provide post-shipment credit to the exporters. The Post-shipment Credit Guarantee has, therefore, been designed to protect Commercial Banks from losses that may be sustained by them in respect of advances granted to Exporters by way of discount/purchase/negotiation of export bills or advances made there against. It, therefore, supplements the cover given to Banks under the Pre-shipment Credit Guarantee. Premium is payable @ 0.05% per month on the highest amount of loan outstanding on any day during the month. like India, Indonesia, Sri Lanka etc. This guarantee, issued in the name of a Commercial Bank, provides cover for all the pre—shipment finance that is extended by it to all of its customers under a single guarantee. In other words, it is a contract between the ECOD and the bank to whom the guarantee is issued and it protects the insured bank in respect of the losses that it may incur while giving pre-shipment credits to its exporter—clients. In comparison to individual Pre-shipment Finance Guarantee, this guarantee is easy to handle, has less paper work and less premium cost. The bank has to submit the proposal for the guarantee in the prescribed form supplied by the ECGD. The guarantee is normally issued for a financial year and premium is payable @ 0.075% per month on the total average products of all accounts (exporters). Today successful competition in the field of export depends not only on the quality of goods and services involved and their price and speed of delivery hut also on the ability to provide better credit terms to match the competitors. Extending credit to a foreign buyer generally poses two problems to an exporter. Firstly, he should be able to find enough resources to offer credit to his overseas buyer and secondly, he should be prepared to face the risk involved in getting payment on the due date from a buyer. A credit transaction involves time-lag from the time the shipment is made until the receipt of the export proceeds. The exporter’s money remains blocked during this period and cannot be utilised for the purpose of execution of further export orders. The exporters seek to avoid this situation by obtaining finance from the banks. But the risk of non-repatriation due to insolvency or the refusal of the buyer, or change in the economic and political condition in the buyer’s country seriously hinders Post-shipment finance by the banks. To remove the exporter’s risk of not being paid by the buyer for his credit sales and to overcome his post-shipment finance problem, the export payment risks policy has been evolved. Moreover, the insured may assign the policy to the bank and such assignment facilitates the former in securing advances easily from the latter against shipment made under Contracts. The exporter is required to submit the proposal for the policy in the prescribed form. Premium rate varies from 0.125% to 2.00% of the invoice value depending on the terms of payment and status of the buyer’s country. 9) First Secretary, National Board of Revenue- Member. After the payment of claims under the Finance Guarantees and Export Payment Risk Policy, the insured is required to make recovery steps including legal action against the borrower and return the recovered amount to the ECGD in the same proportion in which the loss was borne. Genuine expenses incurred by the insured for recovery purpose are shared by the EGGD and the insured in the said proportion. Since inception ECGS in Bangladesh has been playing a positive role in promoting national exports but it could not achieve the desired level of growth due to many constraints such as controversy regarding payment of premium under the finance guarantee, administration of the scheme by a commercial organization, dearth of training facilities on the subject, limited number of schemes, unavoidable delay in settlement of claims etc. However, steps are being taken to overcome these problems. It is expected that the scheme will be able to play an effective role in promoting national exports in the near future. But co—operation of banks and exporters is a pre-requisite for the success of ECGS. It is needless to say that banks and exporters should come forward to help develop ECGS in their own interest as well as in the interest of the country. By lectured By : A.K.M. Jashim Uddin Ahmed. Sadharan Bima Corporation.